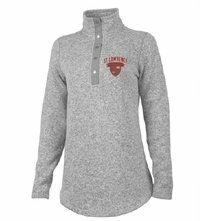 The Women's Hingham Tunic features a knit 100% polyester anti-pill fleece exterior and a brushed interior for ultimate softness and comfort. The tunic length and shirttail hem provides added coverage when paired with leggings or jeans. Additional features include a stand collar and a five button woven placket with metal snaps to aid in temperature regulation. A must-have for chilly days and nights.